The headline of a New York Times’ compilation of user-generated content reads: “The Videos That Are Putting Race and Policing Into Sharp Relief,” showcasing the power of eyewitness video. Don’t share or watch the video of ISIS beheading journalist James Foley. Don’t be voyeuristic and think of his family. Witness, which is based in Brooklyn, was founded in 1992 after the beating of American taxi driver Rodney King in 1991 by Los Angeles police. A local witness saw what was happening and videotaped much of the incident from his balcony. He then sent the footage to the Southern California news station KTLA, and it was later used in court as evidence. The 1992 trial of the four police officers involved in Rodney King’s assault — where none of the four were found guilty — sparked the Los Angeles Race Riots in which dozens died, thousands were injured, and several thousand fires erupted. A local witness had filmed the incident. 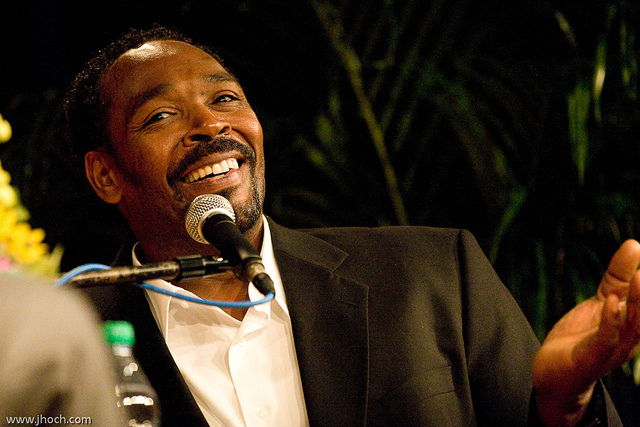 Photo of Rodney King by Justin Hoch on Flickr and reused here with Creative Commons license. Similar to the conversations happening now about how video is revolutionizing the news ecosystem, Witness’s founders (including singer Peter Gabriel) saw video as a powerful platform to hold authorities accountable and spur national dialogues. “What Peter Gabriel wanted to do was to put the power of video in the hands of people,” Bair told an audience at a recent event in New York discussing the current era of civil rights reporting, in which she was also announcing the release of the new guidelines. A video of a standoff between a student journalist and protesters at the University of Missouri is one of the latest videos to have gone viral and sparked discussion about race and civil rights reporting. Screenshot courtesy of Mark Schierbecker, who posted this footage on YouTube. From the curated video content “Watching Syria’s War” on the New York Times, to the recent viral video of a cop abusing a young Black woman in a classroom and even more recently, the standoff at the University of Missouri between a student reporter and fellow student activists, video has become embedded — both literally and figuratively — in the way we report and understand the news. And the actions of news editors, producers and others who utilize this content, whether by incorporating it in a news article or by sharing it on social media, has implications beyond simply informing an audience. Witness staff faced these ethical dilemmas when curating content for its human rights channel, and so initially created these guidelines for themselves. The response to doing that — other journalists and human rights advocates asking advice on what their own guidelines and standards should be — coupled with the discussion in the general public when it came to witnessing and sharing these videos, spurred the creation of this public set of guidelines. “That’s what convinced us there is a gap in resources to help people like us — other human rights advocates and activists — as well as journalists themselves,” Bair said. Context for this video here: http://www.reuters.com/article/2015/10/27/us-south-carolina-police-idUSKCN0SL02320151027See for yourself if you don’t think this is that big of a deal. But while I had wondered if some people might be too emotionally exhausted to witness this kind of viral video of police abuse yet again (hence the “See for yourself” line, to serve as a warning), it didn’t occur to me whether the girl had wanted her identity to be known. Did the benefits of sharing that video then outweigh the costs and ethics of doing so? “We can never really speculate what would be the implications,” she added. Witness will be going through the guidelines in a weekly blog series on its website. The guidelines are available to download here. This piece originally published on November 18 2015, on MediaShift.